Young wheat seedlings growing in a soil. When it comes to yields, the importance of stored soil moisture at planting is often overlooked. However, due to above average temperatures this winter stored soil moisture could be an issue making crop water use a consideration when deciding on crop rotation. 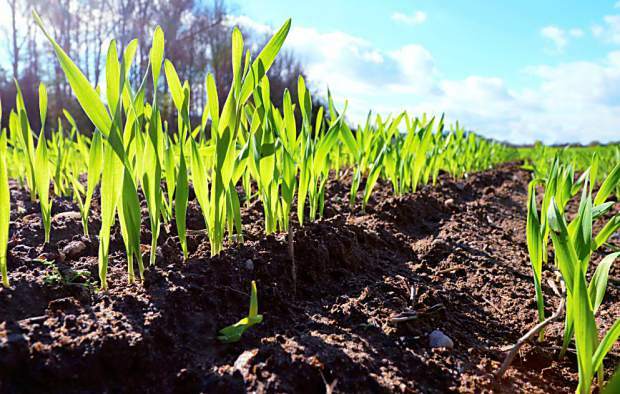 "Crop rotation and tillage practices have a huge impact on the amount of soil water depletion from the previous growing season and on the winter water recharge potential," said Chris Graham, SDSU Extension Agronomist. Table 1 provides a list of common crops grown in the region with average depletion and recharge rates in North Dakota. "Spring wheat and sorghum averaged the highest rate of recharge, but also had larger soil water depletion rates over other crops like field peas and lentils," he said. 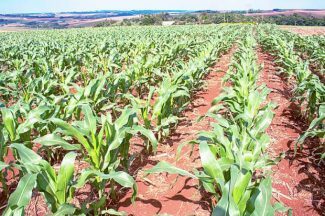 "Conversely, the legumes tend to have lower soil water recharge over the winter, largely due to sparse residue left after harvest." Researchers as far back as the 1930s found that a soil profile to a depth of 3 feet that contained 20 percent stored moisture could dramatically decrease the odds of a wheat crop failure during drought. Graham explained that crops usually rely on a combination of seasonal rains and stored soil moisture to produce good yields; and a 25 percent decrease in stored soil moisture at planting forces the wheat plant to rely to a much greater extent on in-season rains. "In semi-arid regions of the Great Plains, winter recharge of the soil profile is extremely important for successful crop production," Graham said. Above average temperatures this winter led to shallower frost depths in the soil profile. As a result, soils at nearly every location in the state have already thawed through the profile. "This will allow for better infiltration of moisture this spring. However, there is also a potential for increased loss of moisture on warm, windy days," Graham said. The climate outlook for the spring season continues to project warmer than average temperatures. An area just south of South Dakota is currently favored to be wetter than average in the spring season. This could result in better emergence and stand conditions. Even after El Niño wanes this spring, warmer than average conditions are predicted throughout the growing season, which Laura Edwards, SDSU Extension Climate Field Specialist said could mean increased water demand from the crop. "Part of the water supply will need to come from the soil. However, if the forecast stands up, timely rains will be critical to meet the demands of crops later in the growing season," Edwards said. Growing season precipitation often ranges from 12-16 inches in the western part of the state and more than 20 inches in the eastern part of the state. Rapid water uptake in wheat begins shortly after tillering and generally requires between 8 – 12 inches of water to get through heading and then another 6 – 10 inches during the grain fill period.